Every gardener and home cook needs an easy win now and then. Thankfully, growing and using radishes are easy ways to find success in the world of homegrown and home-cooked vegetables. Quick growing and delicious radishes are the perfect addition to gardens of any size and climate. Radishes might not be as sought after as a homegrown tomato, but they are easy to grow in most every climate and a great crop for beginner gardeners. They come in a variety of shapes and colors. Don't let the bland and often super hot grocery store red globes fool you, there are so many different levels of heat and tastes in radishes out there. I was never a fan of radishes from the grocery store, once I started growing my own, however; I fell in love rather quickly. 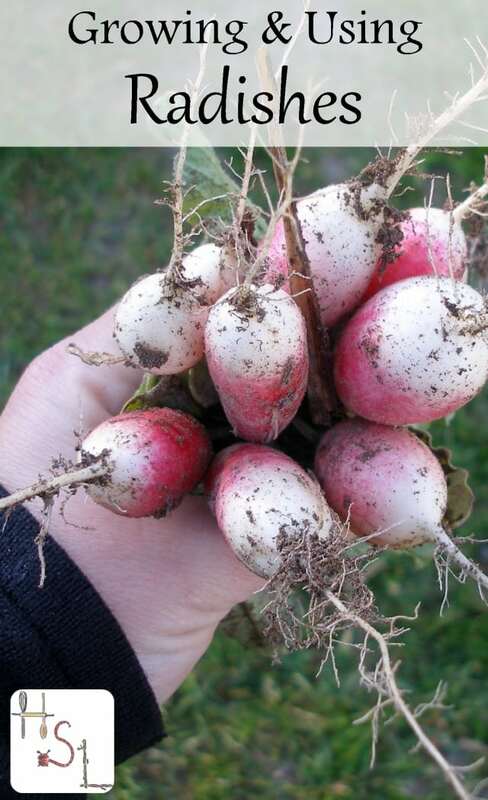 Radishes are so much more than a raw snack or salad fixing too, they're delicious in an enormous range of dishes and shouldn't be overlooked in the kitchen any more than anything else homegrown. Radishes are a very hardy vegetable. They like full sun, so keep them out of the shade. 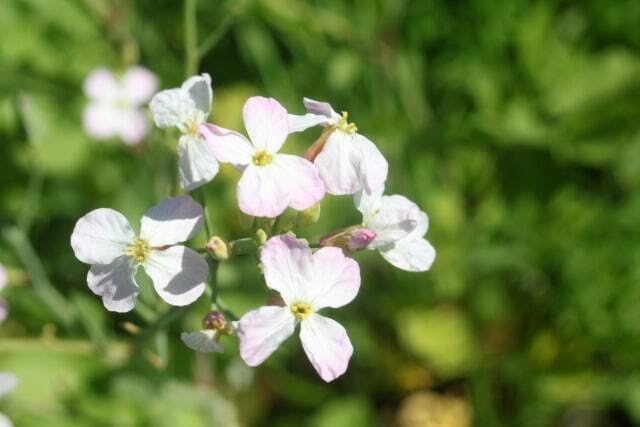 Plant them outside 4-6 weeks before the last frost or as soon as you can work that soil. Seeds should be planted about 1/2″ deep and in rows about 12″ apart. Once the seeds start to come up thin them to 2″ apart (save and eat the thinned greens). For a continuous harvest, sow a row of seeds every other week. They tend to bolt in the heat, so stop sowing in the hottest part of summer and begin again 4-6 weeks before the first frost of fall. Pull as soon as the roots start to stick up out of the soil. If they get too big, they will crack and often get tough and woody. Radishes also seem to get hotter as they get bigger. Allow a few plants to bolt, flower, and go to seed. The seeds cross easily so they're not always the best seeds to save for next year's crop but the dried seeds make for lovely sprouts in the winter. Simply allow the seed pods to dry on the plant, harvest, and then open the pods and store the seeds in airtight container. Sprout for an extra fresh burst of nutrition even in the midst of winter. As an extra bonus, I notice that my bees visit the radish flowers quite a bit and it does seem that radish honey is a thing. Leave a few of those woody radishes so that the bees and other pollinators can have an additional food source in the garden. 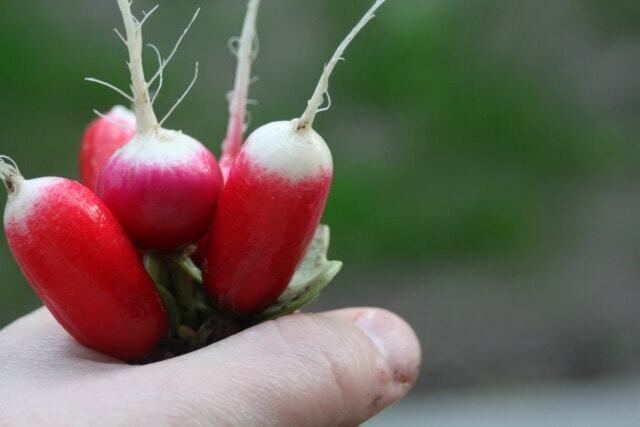 Of course, radishes make a great raw snack and salad fixing but they can be so much more. 1. 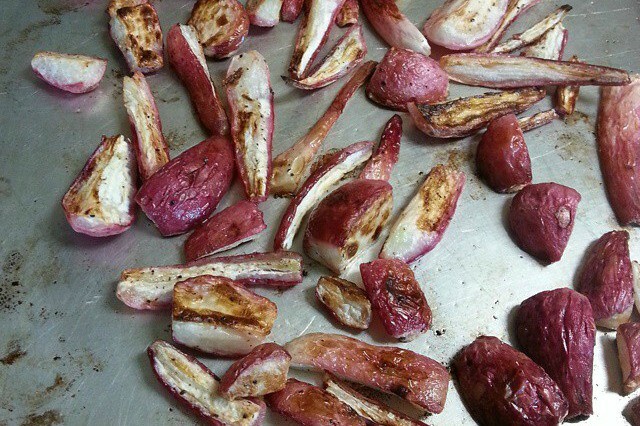 Roasted – It seemed a little strange to me at first too, but my goodness it's a tasty side dish. Preheat oven to 425 degrees. Halve radishes (quarter really large ones), drizzle with a little olive oil, sprinkle on some salt and pepper. Roast in the preheated oven for about 25 minutes or until edges begin to brown. Serve hot. 2. Pesto – No reason to let those leaves go to waste, whip up a batch of pesto and make the most from the entire harvest. 3. Stir Fry – Chop radishes into bite-sized pieces and toss it into stir-fry just like carrots. They're mighty tasty cooked up with snow peas, another early spring vegetable. 4. Ferment – Pickles make a great fermented veggie and are super easy to whip up for the novice and experienced alike. 5. Baked Goods – Grate the radishes and used instead of zucchini or carrots in baked goods. The flavor is slightly different, but delicious and not so much that anyone would guess radish and like adding other vegetables makes for a supremely moist baked good. 6. 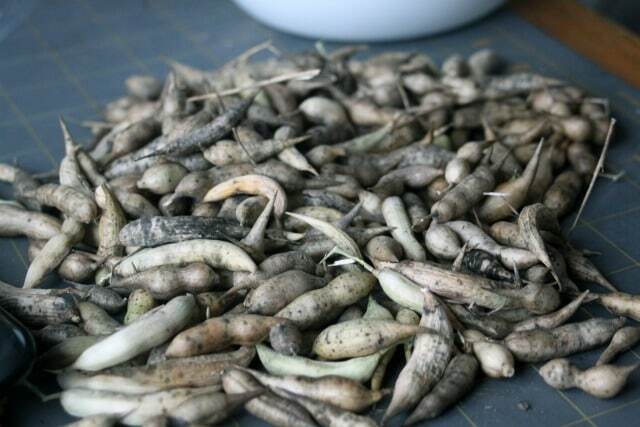 Pickles – Can up radish pickles to enjoy all winter long. Be sure to plant a few different varieties of radishes this spring so that you can discover which type best suits your family's tastes and keep them growing for years to come. What's your favorite type of radish and way to use it up? Only my father in law likes radishes in our family. Granted the only way we’ve ever had them is raw. But I do plant them because I once read that bug would prefer their leaves over other leaves such as squash. Who knows if that is true, but I plant a few in each bed just to be on the safe side. You’ve inspired me to try a few different ways of eating them, though. Thanks! I’ve never heard that about the bugs before, interesting little tidbit, the leaves do get pretty chewed up. Try ’em roasted, every veggie tastes amazing roasted it seems, ha! My kids loved the pickled radishes we made last summer…..you are tempting me to get mine planted this week. It is a bit early in my zone 4 garden, but the weather has been warm enough to bring the soil temp up. I am thinking of getting the turnips in too. Thanks for the tips. Yay for planting! My garden is still so very wet but it won’t be long now. I need to try radishes roasted because I just don’t like them! I grow them for the animals because, well, they grow! Let me know if you like them roasted! Quick, easy to grow animal feed is always a good thing too. Thanks for the link – and the ideas! I’ve tried radishes sautéed (I wasn’t a fan) but never thought about putting them in baked goods! The tops of my radishes always come out lovely,band we eat them in salads. But the root, or bulb part never develops! Any suggestions? I even use blood meal on them. My first inclination was maybe some kind of animal – gophers, voles maybe eating the bulbs but you would probably notice that. Are you thinning them enough? Too close together and the roots don’t form well. I have planted and eating radishes all my life basically raw. We had an abundant crop a couple of years ago and the wife went looking for things to do with them, and came up with making RADISH RELISH man that is the best thing since home made bread. It actually makes an old hot dog worth eating again. beats any of those old store bought relishes hands down. Wow that sounds awesome! Thanks for that great idea. Would be interested in knowing just what goes into a radish relish. Would be fun to try.